Dairy Free Mac and Cheese. I have never been a fan of mac and cheese, but my husband loves it. Before we changed our diets, he would get the frozen Stouffer’s mac and cheese. The sodium count alone is scary, never mind the rest of the ingredients! 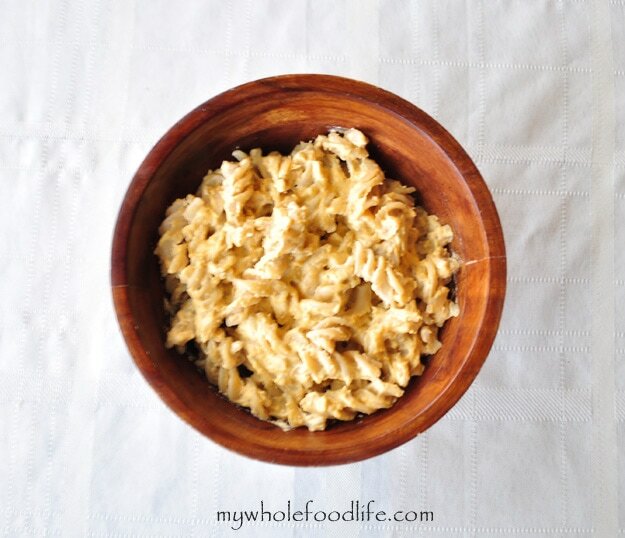 Now he makes this dairy free mac and cheese instead. In a blender , combine all the other ingredients for the sauce. You can add more milk if the mixture seems a bit thick. There also may be some cheese sauce left over. The extra sauce should keep in the fridge for a few weeks. Enjoy! Hi! My daughter can't have dairy so I would love to try this! I have been buying Amy's dairy free mac & cheeze, but at $4 a pop it is breaking the bank, lol! Question...would spelt flour be OK (we are fine with gluten), and can I sub onion powder for the minced onion? We like the onion flavor but my picky daughter will not like the minced onion texture (trust me, I have tried, lol!) Also, for the milk...I assume an unsweetened soy milk, right? Last one =) For storage, how long will this keep in the fridge, and do you think it would freeze? My three girls would seriously eat mac 7 cheese every day, so I would love to make a big batch! Thanks so much!!! Spelt flour should work okay and so would the onion powder. I did use unsweetened soymilk, but you could also use almond, oat or rice milk if you don't want to do soy. I have never tried to freeze this dish because pasta typically doesn't freeze great in my opinion. It should last in the fridge for about a week. If you freeze it and it works out for you, let me know. :) I hope you like it. I've never had any problem freezing pasta dishes. Thanks for the recipes. I've never bought (or tasted) nutritional yeast. Do you have any recommendations for brand/type? or are they pretty much the same? They are all pretty much the same. I get mine out of the bulk bins at Whole Foods. Thanks for the reply. I just bought some at WF. :) I look forward to making this recipe. I hope you enjoy it. I also have a non dairy cheese sauce made from cashews that would be great on pasta. Hi. I have been reading your blog and recipes for a while. I've been changing our food here and eating. I've not tried any recipes yet because I live in the middle of no where and have very little access to most of the ingredients you mention, it's a shame to say but I can only find junk readily available. Lol..I am researching large grocery stores to determine which will offer the best selection of supplies. Then I can plan a trip. I'm very interested it trying many recipes. Thank you. I will keep you posted. I would love to know how you like them! :) FYI, I put Amazon links to many of the ingredients in my posts because I know many readers do live in remote areas. Maybe you can find some stuff on there? This looks so good! Can't wait to try it; however I am going to purchase the nutritional yeast on amazon and they offer both a powder and flakes, which should I use? Thanks for sharing! I love your blog - fantastic recipes! We love this dairy alternative "cheese" sauce in our house! You can also pour it over nachos! Also, you can add a few slices of red bell pepper or a few jarred pimentos to it for added color. It does not alter flavor, but gives it a bit more of that orangey coloring that kids are used to. I sometimes add a teaspoon or two of lemon juice - it gives it a little depth. Thanks Colleen! Those are great suggestions! I will try that sometime. Have you ever tried coconut milk in place of the almond? Thank you so much, I love your website. I really want to try this but there is one problem- Do you have any alternatives for nutritional yeast? I hate hate hate the flavor of it. You might be able to omit it. If you do, please let me know how it comes out. This looks so yum!! Any tips on how to make it nut free though? Thank you! You might be able to make it nut free by using white beans or butternut squash. I would like to make this dairy free recipe, however, my niece is deathly allergic to cashews. Is there an alternative to cashews or should I just forget about dairy-free cheese? I have seen some people make cheese out of eggplant. Maybe you can try that? I bet you can google a recipe. Melissa, I use cauliflower to create an "alfredo sauce" I use all the same ingredients but roast cauliflower in the oven and then add all the same ingredients into a food processor. Hi Tarah! I do that too. So yummy! I have a recipe for it on the blog. I serve it over zucchini noodles. So good! I have never tried, but many of my readers have with success. Hi, I have recently found out I am allergic to yeast. Do you know if there is something else or if the recipe would work without the nutritional yeast?